Make your own princess costume with this giant list of DIY costume tutorials: DIY Snow White costume, Rapunzel, Cinderella, Anna, Elsa, Belle, and more! Every year about this time I wander into Costco with my daughter and she catches sight of the racks of princess dresses, and I know what the next words out of her mouth will be: Mom, can we get one? And I usually say no, not because she already has too many costumes (although she may, in fact, already have too many costumes). The problem is that I don’t like most of the princess costumes sold in stores: they’re usually are made from cheap material that’s scratchy, uncomfortable, and prone to tearing after just a few wears. Whether you need a princess costume for Halloween, or just for everyday play, it’s often better (and cheaper) to make it yourself. So today’s post includes a giant list of DIY princess costume tutorials, including DIY Snow White costumes, DIY Rapunzel costumes, DIY Belle costumes, and more. Some are sewing tutorials with free patterns, others are simple t-shirt hacks, and a few more are even simpler than that! 1. Make an easy DIY Snow White costume using this free Snow White dress up apron pattern from It’s Always Autumn. It’s available in 3 sizes to fit most kids. 2. Rae Gun Ramblings shares a tutorial for a DIY Snow White shirt for adults, but it would be easy to make for kids as well! 3. This handmade Snow White costume tutorial from Fleeting Thing includes lots of photos showing the pieces cut out and how they are put together. 4. Major Hoff Takes a Wife shows how to transform an easy peasant dress pattern into a DIY Snow White costume. 5. 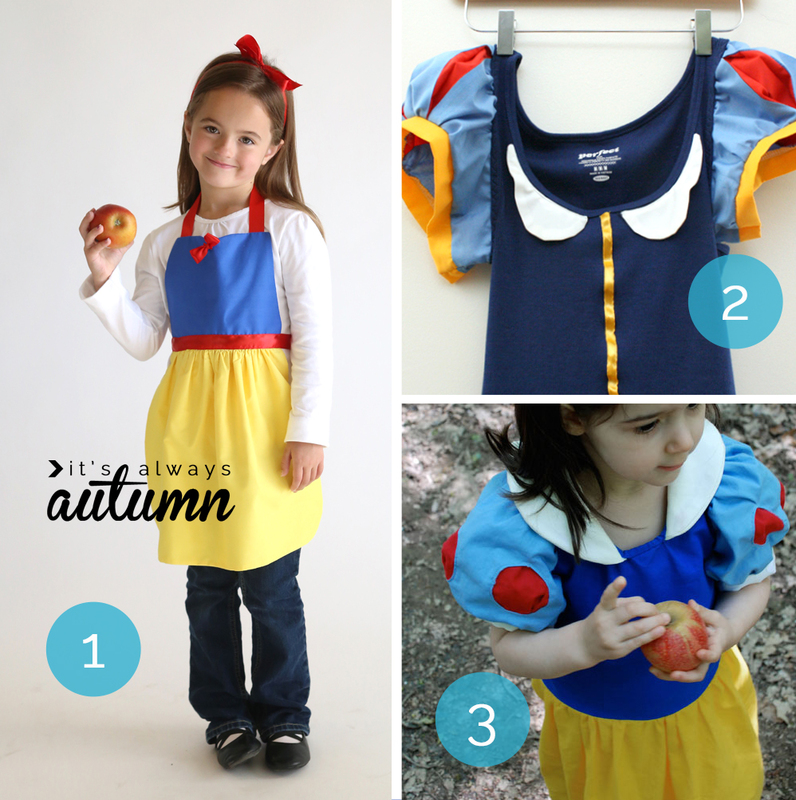 This Snow White costume from I Am Style-ish is put together with items from the thrift store! 6. 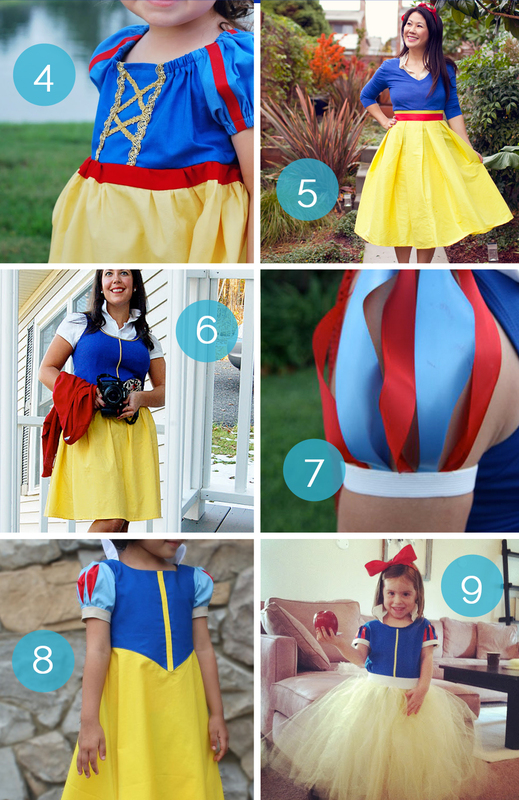 Crafty Teacher Lady shows you how to make the simplest ever homemade Snow White costume using a mix of owned and purchased items along with a link to an easy skirt tutorial. 7. Mama Makes Stuff has a tutorial for a Snow White running costume. Her easy sleeve tutorial could be added to any blue tank top and yellow skirt for a quick DIY Snow White costume! 8. This DIY Snow White dress from Candice Ayala includes a great tutorial for the pleated sleeves. 9. Always Underfoot has another homemade Snow White costume tutorial, starting with a blue t-shirt. 10. Salty Cinderella shows you how to dress up a store bought tee to make a soft + comfy Rapunzel costume. 11. Use this free Rapunzel dress up apron pattern from It’s Always Autumn to make a super easy DIY Rapunzel costume for kids. 12. 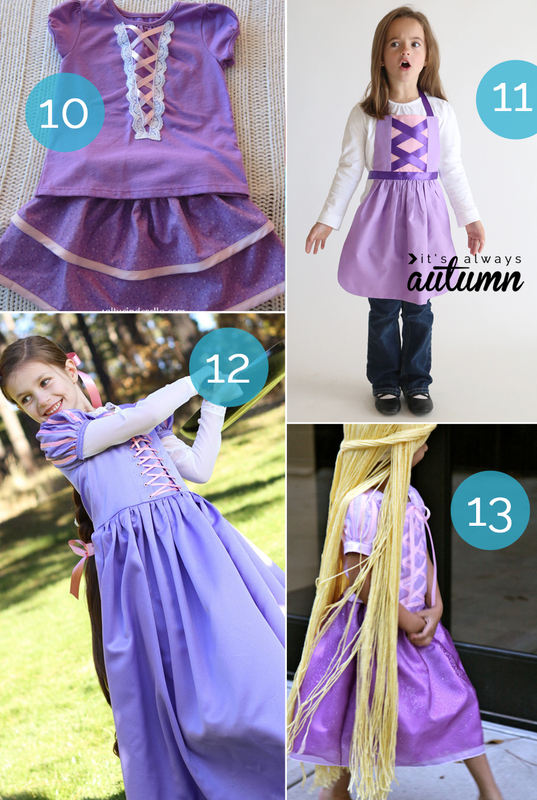 This beautiful DIY Rapunzel Costume comes from Make it and Love it (great tutorial!). 13. Sew Like My Mom shows you how to make this Rapunzel costume (complete with amazing yarn wig) by tracing existing clothes to create your own pattern. 14. Check out this tutorial on Inspiration Made Simple to learn how to make a yarn wig for Rapunzel. 15. This DIY Belle costume for adults from Merrick’s Art starts with a store bought dress and adds a homemade apron. 16. The Hair Bow Company shows you how to make Belle’s ball gown using a tutu dress. 17. It’s Always Autumn has an easy Belle dress up apron pattern that makes a really cute DIY Belle costume! 18. 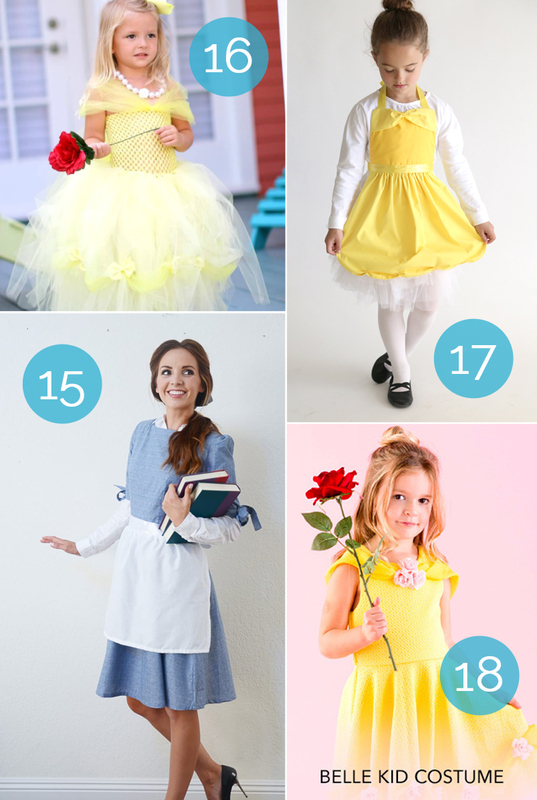 This tutorial from Disney starts with a yellow dress and adds a few details to make a DIY Belle costume. 19. Rae Gun Ramblings shares an easy to sew homemade Anna costume for babies. 20. Next, Kiki & Company has a great DIY Elsa costume tutorial which includes a removable velcro train. 21. Merrick’s Art shows how to make an adult Elsa costume with simple sewing. 22. 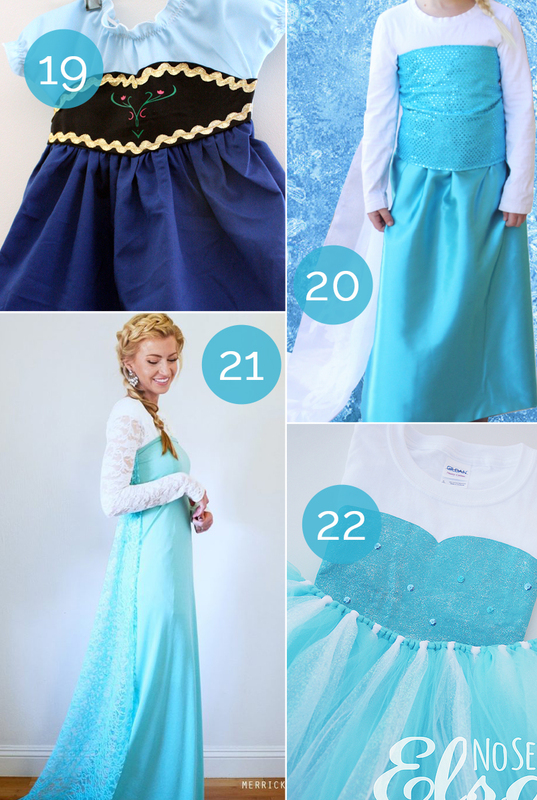 Eighteen25 shares an easy, no-sew DIY Elsa costume made with a painted tee and a tutu skirt. 23. Get the easy Elsa dress up apron pattern from It’s Always Autumn. 24. Sew Can Do shows how she made her own DIY Merida (Brave) costume, complete with lots of photos and instructions. 25. Cherish 365 shares a no-sew tutu Sleeping Beauty costume. 26. This gorgeous, in-depth sewing tutorial for a beautiful Cinderella costume comes from Make it and Love it. 27. This adult Ariel costume from Merrick’s Art would be easy to make for kids as well. 28. Homemade Toast has an in-depth sewing tutorial for a DIY Cinderella costume that includes a free pattern. 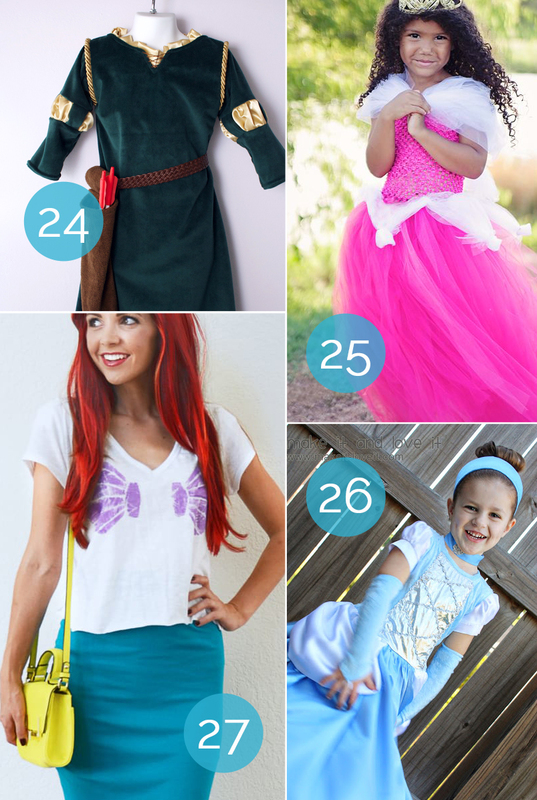 Hope this giant list of DIY princess costumes helps you out this Halloween! Love this compilation of costumes. Perfect for my 1 granddaughter…..Anything in the works for my 8….gandsons? What a great list? Why doesn’t the Pinterest thing pin? Do you have this whole thing on on your Pinterest page (I’ve seen a couple of aprons, but not the whole thing. Thanks for your help!